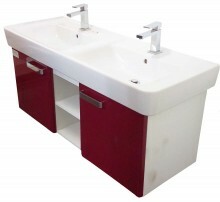 Frakem.com offers you our range of stylish set of bathroom cabinets made with high quality materials and design that will bring not just add class to your bathroom/kitchen but also long lasting function, giving your room the ideal look of a contemporary home. 1200 x 735mm underbasin furnish cabinet unit with vanity unit, red gloss: A high grade cabinet with multiple compartments. Made with a high quality material but light in weight. Click the button below to add the 1300mm Bathroom Cabinet with dual washbasin to your wish list.